A national award which recognises dedication to grass roots cricket has been won by a Ketton Cricket Club stalwart. Chris Mainstone has been named as the winner of the Community Champion Award 2018. Mainstone wowed the judging panel with his relentless commitment to the junior section at Ketton Cricket Club in Rutland over the past 14 years. The Community Champion is a joint initiative between The Cricketer and MCC, which recognises grass roots dedication to the sport. This year, more than 100 individuals were nominated by their peers and team-mates, with Mainstone the outstanding candidate from a shortlist of 10. “I was really shocked and surprised. I didn’t know anything about it,” he said. “I was absolutely speechless and on the edge of tears. It’s lovely for the guys at the club to have gone to the effort of nominating me. Mainstone’s prize for winning the Community Champion Award is the opportunity to ring the five-minute bell at Lord’s prior to the one-day international between England and India on July 14, which he and a friend will attend as guests of MCC president Lord MacLaurin, who sat on the judging panel alongside MCC chief executive Guy Lavender, The Cricketer Publishing Ltd chief executive Guy Evans-Tipping and The Cricketer editor Simon Hughes. “His tireless efforts to build a thriving junior section at Ketton CC, as well as his commitment to encouraging other volunteers to ensure that the juniors continues to be sustainable, made him the standout candidate,” said MCC chief executive Guy Lavender. “Although there were other immensely deserving individuals who featured on the shortlist, we were unanimous in our decision that Chris Mainstone should be this year’s winner. Evans-Tipping said: “This is the second year we have run the Community Champion Award with MCC. We received hundreds of entries, each one telling a heartening story of an individual making a difference to their community through the promotion of cricket. Chris Mainstone stood out as this year’s exceptional candidate and we are delighted to recognise his tireless devotion to his club and community through cricket”. Mainstone reinvigorated Ketton’s youth set-up after assuming responsibility for children’s cricket at the club in 2004, and by the end of the 2017 season there were more than 100 youngsters playing across seven age groups. Eighteen have been selected for the Leicestershire Pathway Programme with two girls winning their age-group county caps. To help finance the growing section, Mainstone has organised several fundraisers, including car boot sales, tournaments and quizzes. According to the two committee members who nominated him - Paul Mahoney and John McAvoy - Mainstone’s infectious enthusiasm for junior cricket encouraged “an army of volunteers” to sign up to the cause. Mainstone wanted to pay tribute to a number of those helpers, without whom he says his success at Ketton would not have been possible. “I guess I instigated a lot of what has happened at the club but a lot of people have been involved and I want to make sure they get the recognition they deserve,” he said. “There’s a huge number of people who have got involved in organising various teams that we’ve developed over the years - people like Graham Young, John McAvoy, Arnie Palmer - each team has had a group of volunteers and they are too numerous to name. “Simon Forster was with me right at the outset, volunteering to help me get things going. He took on a treasury role and helped me coaching. He’s still there now on the committee and has been massively important in all this. “Nikki Miles has helped with the girls’ squad, Matt Walker, Julian Watkins and particularly John McAvoy who took over the junior co-ordinator role from me a few years back and has done a wonderful job of continuing the work. 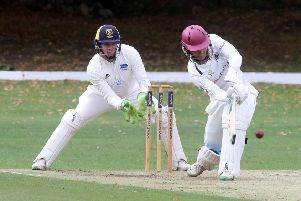 “The cricket side couldn’t have happened without people doing the ground and in particular I’d like to mention Peter Shakeshaft and Brian Thompson who have done incredible amounts of work doing junior pitches, practically killing themselves.